Absinthe, first created by Pierre Ordinaire in 1792, originates from France. It is generally bottled with a high alcohol content but always diluted with water (known as louching) which reduces the alcohol content allowing the aroma and taste to be released from the botanicals it contains. Absinthe’s flavor is usually toward that of anise. Distilled using botanicals including the flowers and leaves from wormwood plant (Artemisia absinthium), it also uses sweet fennel, anise and other herbs. Addition of a final coloring step in the distillation process produces the green absinthe or verte. When no coloring step is used, the absinthe is clear or a blanche. La Bleue Clandestine is a blanche. ​Commonly referred to as the Green Fairy, it is found in many social references such as the film "Moulin Rouge" as well many mentions in current and past literature. Although many call absinthe a liquor, it is by definition a spirit as it is not made with added sugar. 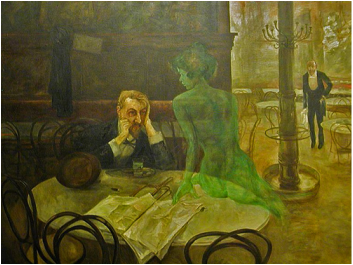 In the past, absinthe was portrayed as a dangerous, addictive drug that caused hallucinations. Thujone (a ketone and monoterpene found in absinthe derived form the wormwood plant) is often blamed for its harmful effects even though it is present in only trace amounts in the spirit. By the early 20th century, absinthe was banned in the U.S. and most of Europe. Even though absinthe was harshly criticized for being addictive, hallucinogenic and poisonous, it is no more dangerous than any other spirit. After the modernization of the EU food and beverage laws in the late 1900s, absinthe began to rise again in popularity. By the beginning of the 21st century, over a hundred different kinds of absinthe were being produced in over 10 countries including Switzerland, France and the U.S. It is commonly believed that the downfall of the vineyards of France in the late 1800’s indirectly led to the Green Fairies popularity. When French vineyards were hit with a phylloxera outbrake (grapevine pests) and the price of wine skyrocketed, the working class started drinking cheaper spirits like absinthe. 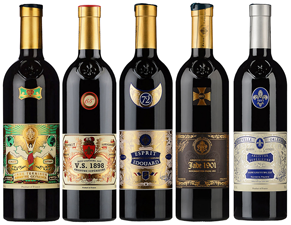 ​By the early 1900s, absinthe had grown in popularity and was far outselling local French wines. In Fact, absinthe had grown in popularity in other countries as well and was being heavily consumed over most of Europe. In the late 1800’s, 2 million gallons of absinthe was exported from Europe to the U.S alone. ​Vineyard owners were not happy absinthe's popularity and employed various methods to get rid of absinthe so wine could again be France's drink of choice. Through political lobbying, false information and propaganda campaigns, absinthe was made illegal in 1898 in the colony of the Congo Free State, 1909 in the Netherlands, in 1910 in Switzerland, 1912 in the United States and 1914 in France. Absinthe was believed for many years to be illegal in the U.S. but we are now finding out absinthe may have never been illegal at all. ​This is because the absinthe ban in the U.S. was for absinthe made with more than 10 ppm (parts per million) of thujone and most absinthe produced worldwide today contain 10 ppm of thujone or less. Once this was realized by liquor vendors and absinthe enthusiasts, the current absinthe revival was born.